I am very fortunate to have a neighbour who grows lots of veg and shows it in the local village shows. 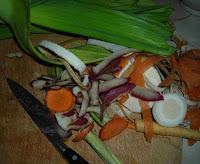 There is always too much for him and his wife, so they bring me bags of lovely veg. Peel the vegetables and chop roughly. 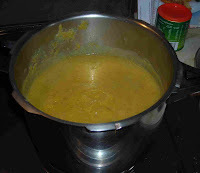 Saute in a little vegetable oil, then cover with boiling water from the kettle and a tablespoon of Marigold Vegetable Bouillon or other stock. I use my pressure cooker and cook for about 20 minutes, if you don't have one, then just cook until all the veg are soft. Whizz with a handheld blender until smooth and add a little milk or stock until it is of the consistency you want.